Chemical waste is a waste that is made from harmful chemicals (mostly produced by large factories). Chemical waste may fall under regulations such as COSHH in the United Kingdom, or the Clean Water Act and Resource Conservation and Recovery Act in the United States. In the U.S., the Environmental Protection Agency (EPA) and the Occupational Safety and Health Administration (OSHA), as well as state and local regulations also regulate chemical use and disposal. Chemical waste may or may not be classed as hazardous waste. A chemical hazardous waste is a solid, liquid, or gaseous material that displays either a “Hazardous Characteristic” or is specifically “listed” by name as a hazardous waste. There are four characteristics chemical wastes may have to be considered as hazardous. These are Ignitability, Corrosivity, Reactivity, and Toxicity. This type of hazardous waste must be categorized as to its identity, constituents, and hazards so that it may be safely handled and managed. Chemical waste is a broad term and encompasses many types of materials. Consult the Material Safety Data Sheet (MSDS), Product Data Sheet or Label for a list of constituents. These sources should state whether this chemical waste is a waste that needs special disposal. 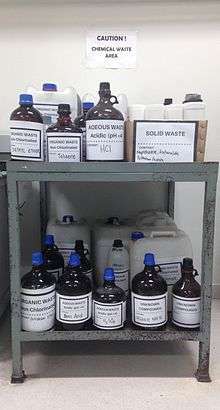 In the laboratory, chemical wastes are usually segregated on-site into appropriate waste carboys, and disposed by a specialist contractor in order to meet safety, health, and legislative requirements. 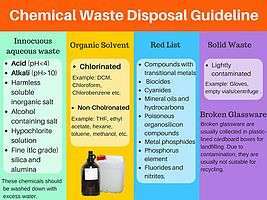 Chemical waste category that should be followed for proper packaging, labelling, and disposal of chemical waste. Innocuous aqueous waste (such as solutions of sodium chloride) may be poured down the sink. Some chemicals are washed down with excess water. This includes: concentrated and dilute acids and alkalis, harmless soluble inorganic salts (all drying agents), alcohols containing salts, hypochlorite solutions, fine (tlc grade) silica and alumina. Aqueous waste containing toxic compounds are collected separately. Waste elemental mercury, spent acids and bases may be collected separately for recycling. Waste organic solvents are separated into chlorinated and non-chlorinated solvent waste. Chlorinated solvent waste is usually incinerated at high temperature to minimize the formation of dioxins. Non-chlorinated solvent waste can be burned for energy recovery. In contrast to this, chemical materials on the "Red List" should never be washed down a drain. This list includes: compounds with transitional metals, biocides, cyanides, mineral oils and hydrocarbons, poisonous organosilicon compounds, metal phosphides, phosphorus element, and fluorides and nitrites. Moreover, the Environmental Protection Agency (EPA) prohibits disposing certain materials down any UVM drain. Including flammable liquids, liquids capable of causing damage to wastewater facilities (this can be determined by the pH), highly viscous materials capable of causing an obstruction in the wastewater system, radioactive materials, materials that have or create a strong odor, wastewater capable of significantly raising the temperature of the system, and pharmaceuticals or endocrine disruptors. Broken glassware are usually collected in plastic-lined cardboard boxes for landfilling. Due to contamination, they are usually not suitable for recycling. Similarly, used hypodermic needles are collected as sharps and are incinerated as medical waste. Many chemicals may react adversely when combined. It is recommended that incompatible chemicals be stored in separate areas of the lab. Acids should be separated from alkalis, metals, cyanides, sulfides, azides, phosphides, and oxidizers. The reason being, when combined acids with these type of compounds, violent exothermic reaction can occur possibly causing flammable gas, and in some cases explosions. Oxidizers should be separated from acids, organic materials, metals, reducing agents, and ammonia. This is because when combined oxidizers with these type of compounds, inflammable, and sometimes toxic compounds can occur. When disposing hazardous laboratory chemical waste, chemical compatibility must be considered. For safe disposal, the container must be chemically compatible with the material it will hold. Chemicals must not react with, weaken, or dissolve the container or lid. Acids or bases should not be stored in metal. Hydrofluoric acid should not store in glass. Gasoline (solvents) should not store or transport in lightweight polyethylene containers such as milk jugs. Moreover, the Chemical Compatibility Guidelines should be considered for more detailed information. Packaging, labelling, storage are the three requirements for disposing chemical waste. How to properly label, package, and store chemical waste safely. For packaging, chemical liquid waste containers should only be filled up to 75% capacity to allow for vapour expansion and to reduce potential spills which could occur from moving overfilled containers. Container material must be compatible with the stored hazardous waste. Finally, wastes must not be packaged in containers that improperly identify other nonexisting hazards. In addition to the general packaging requirements mentioned above, incompatible materials should never be mixed together in a single container. Wastes must be stored in containers compatible with the chemicals stored as mentioned in the container compatibility section. Solvent safety cans should to be used to collect and temporarily store large volumes (10–20 litres) of flammable organic waste solvents, precipitates, solids or other non-fluid wastes should not be mixed into safety cans. Label all containers with the group name from the chemical waste category and an itemized list of the contents. All chemicals or anything contaminated with chemicals posing a significant hazard. All waste must be appropriately packaged. When storing chemical wastes, the containers must be in good condition and should remain closed unless waste is being added. Hazardous waste must be stored safely prior to removal from the laboratory and should not be allowed to accumulate. Container should be sturdy and leakproof, also has to be labeled. All liquid waste must be stored in leakproof containers with a screw- top or other secure lid. Snap caps, mis-sized caps, parafilm and other loose fitting lids are not acceptable. If necessary, transfer waste material to a container that can be securely closed. Keep waste containers closed except when adding waste. Secondary containment should be in place to capture spills and leaks from the primary container, segregate incompatible hazardous wastes, such as acids and bases. TOXMAP is a Geographic Information System (GIS) from the Division of Specialized Information Services of the United States National Library of Medicine (NLM) that uses maps of the United States to help users visually explore data from the United States Environmental Protection Agency's (EPA) Toxics Release Inventory and Superfund Basic Research Programs. TOXMAP is a resource funded by the US Federal Government. TOXMAP's chemical and environmental health information is taken from NLM's Toxicology Data Network (TOXNET) and PubMed, and from other authoritative sources. 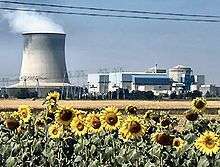 Another issue regarding chemical waste is the potential risk of surface and groundwater contamination by the heavy metals and radionuclides leached from uranium waste-rock piles (UWRP) A Radionuclide is an atom that has excess nuclear energy, making it unstable. Uranium waste-rock piles refers to Uranium mining, which is the process of extraction of uranium ore from the ground. An example of such threats is in Saskatchewan, Uranium mining and ore processing (milling) can pose a threat to the environment. In open pit mining, large amounts of materials are excavated and disposed off in waste-rock piles. Waste-rock piles from the Uranium mining industry can contain several heavy metals and contaminants that may become mobile under certain conditions. Environmental contaminants may include acid mine drainage, higher concentrations of radionuclides, and non-radioactive metals/metalloids (i.e. As, Mo, Ni, Cu, Zn). ↑ Hallam, Bill (April–May 2010). "Techniques for Efficient Hazardous Chemicals Handling and Disposal". Pollution Equipment News. p. 13. Retrieved 10 March 2016. ↑ "LABORATORY CHEMICAL WASTE MANAGEMENT GUIDELINES" (PDF). Environmental Health and Radiation Safety University of Pennsylvania. Retrieved 10 March 2016. 1 2 3 "Waste - Disposal of Laboratory Wastes (GUIDANCE) | Current Staff | University of St Andrews". www.st-andrews.ac.uk. Retrieved 2016-02-04. ↑ Shibamoto, T; Yasuhara, A; Katami, T (2007). "Dioxin formation from waste incineration.". Reviews of environmental contamination and toxicology. 190: 1–41. PMID 17432330. ↑ Europa. "Waste incineration". Retrieved 10 March 2016. ↑ "Chemical Waste Management | Environmental Health and Safety at UVM". www.uvm.edu. Retrieved 2016-02-04. ↑ "Chemical Compatibility and Segregation Guides". orf.od.nih.gov. Retrieved 2016-02-12. ↑ "How to Store and Dispose of Hazardous Chemical Waste". blink.ucsd.edu. Retrieved 2016-02-12. 1 2 "General Requirements". www.ehs.utoronto.ca. Retrieved 2016-02-19. ↑ Laboratory, National Research Council (US) Committee on Prudent Practices in the (2011-01-01). "Management of Waste". Retrieved 10 March 2016. ↑ "Laboratory Waste Disposal" (PDF). Retrieved 10 March 2016. ↑ "PROCEDURES FOR LABORATORY CHEMICAL WASTE DISPOSAL" (PDF). Memorial University. Retrieved 10 March 2016. ↑ "SIS Specialized Information System". United States National Library of Medicine. Retrieved 11 August 2010. ↑ "Toxnet". United States National Library of Medicine. Retrieved 11 August 2010.